Insulating under a mobile home isn’t the most exciting remodeling project but it does make a huge difference! We’ll go over the steps one couple took to install foam insulation board under their home, learn about the different types of foam insulation, and cover underbelly repair. If you’re looking to insulate your home this is going to be a very helpful article for you. When Laurel and Bryan Adams moved into their 1974 Olympic single wide mobile home they were excited to start remodeling. The couple’s new vintage mobile home had served Laurel’s aunt very well until she passed last year at the age of 93. While the mobile home’s decor may not have made it to the cover of Home and Garden, auntie had lovingly updated it over the years. She had heroically painted the walls herself with a three-inch paintbrush in bright yellow and aqua. It was a sound, affordable home that had loads of potential! The first year in a new home, especially an older mobile home, is always a learning experience. The Adam’s vintage mobile home sits in Edmonton, Alberta, and since older mobile homes are notoriously under insulated, they experienced wild temperature fluctuations during their first winter. Once Spring arrived, the couple set out to find a way to increase the home’s energy efficiency, especially in the ‘death-zone’, as Laurel playfully called it. The death zone was an area 2 to 3 feet above the floor that remained much colder than the rest of the home. Out here in the real world, we have budgets and can’t just call up a pro every time we have an issue in our home. For us, it’s usually either DIY or not at all! You may want to read ourhttps://mobilehomeliving.org/guide-mobile-home-insulation/ guide to mobile home insulation here to learn a bit more about your options before you decide on foam board. Laurel and Bryan figured out a great way to insulate under their home and solve their problem energy loss at an affordable price. They were kind enough to share the details of their project with us, complete with hand-drawn images. How cool is that? The Adam’s were able to buy their 4′ x 8′ insulation foam board from the manufacturers directly. That saved them almost half off the retail price. It pays to cut out the middleman whenever possible! The mobile home’s floor joists are on 16″ centers, which means the wood floor joists are placed 16″ apart from each joist’s center point. Since the joists themselves are roughly 1.5″ wide the section between each joist was approximately 14.5″ wide. It’s this 14.5″ section that received the insulated foam board. Bryan bought 2″ thick Styrofoam insulation board and used a table saw to cut the boards 14.5″ so that the foam was easy to push between the joists and stay put (there are 4″ foam boards available but the 2″ is easier to handle). 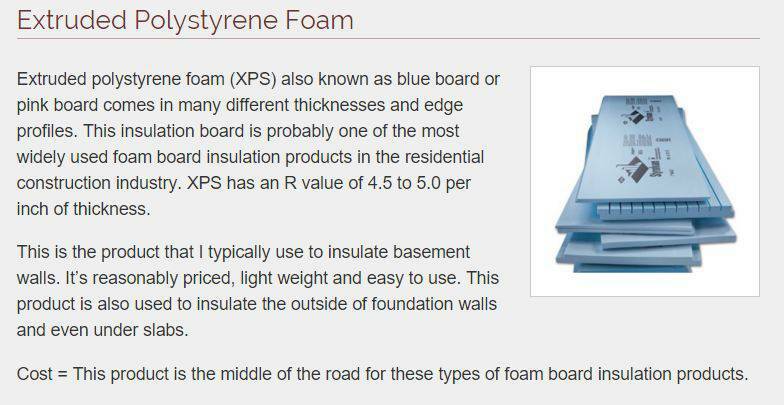 Bryan concluded that layering 4 boards together to create an 8″ total thickness of insulating foam would work best for their area’s average winter temperatures. Each stack was made of three 14.5″ wide by 2″ thick foam boards. The fourth foam board was left full-size (4′ x 8′) and attached to the bottom of the wood joists. This holds the 3 boards above it in place and creates a total of 8″ of insulation under the entire mobile home. To secure the full-size sheet to the bottom of the home Bryan used 3″ screws with a 1″ wide fender washer. Since the home was built on 2 steel beams at an 8′ interval he simply used the lip of the steel beams to act as a shelf for the ends of the foam board. The wood joists are a bit shorter than the steel beams so this method worked well. Laurel also drew a schematic of the screw placement. She explained that had Bryan not been able to screw into the bottom of the wood joists that he could have used a couple different options to secure the foam. A thin wooden lathe could have been used as a bridge to hold the foam into place. He could have also went the more expensive route and enclosed the entire bottom of the home with 1/4″ plywood. The results of the Adam’s DIY insulation project has been a great success! Laurel states that the ‘dead zone’ is long gone and since the foam has insulated the duct-work under the home the forced air heat is reaching the end rooms better. Since foam board can also act as both an insulator and a vapor barrier for your mobile home it’s ideal to install under your flooring. 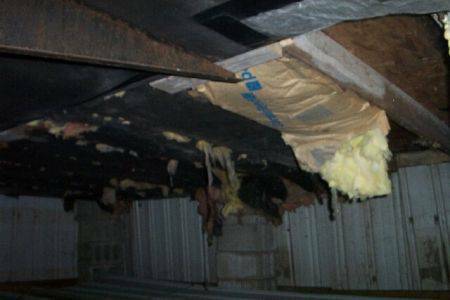 Fire is probably the biggest disadvantage of foam board insulation and meeting your local fire protection codes may be bothersome. Foam is fairly hard to ignite, but once it catches it emits a dense smoke and toxic gases. However, some manufacturers spray the foam with fire retardant. You’ll want to research your local codes. The three most common types of foam board are made of polystyrene, polyisocyanurate, and polyurethane. All are petroleum-based products. 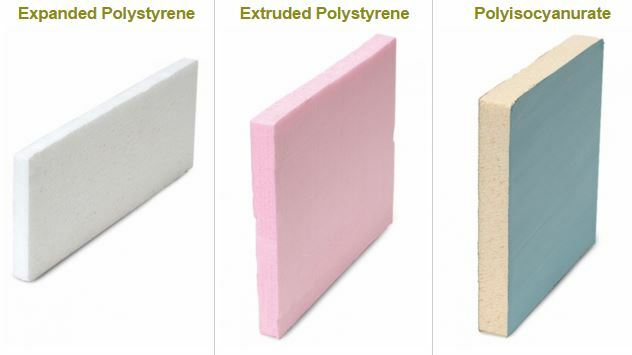 Expanded polystyrene is the most common type of foam insulation and the most affordable. It is made from the same closed cell foam beads that your coffee cups and shipping peanuts are made from. It is molded, or extruded, into large sheets that can be used in roofing, flooring, siding, and other construction needs. The R-value of EPS sheets depends on the density, with a single sheet of foam ranging from 3.6 to 4.2 per inch. Extruded polystyrene is very similar to expanded polystyrene but it uses pellets instead of beads, making it smoother and denser. It also has better water resistance. You’ll recognize this product by its colors – it comes in blue, pink, and green depending on the manufacturer. You’ll pay more for extruded polystyrene but you’ll get better energy efficiency. The R-value of extruded polystyrene is around 5 per inch. 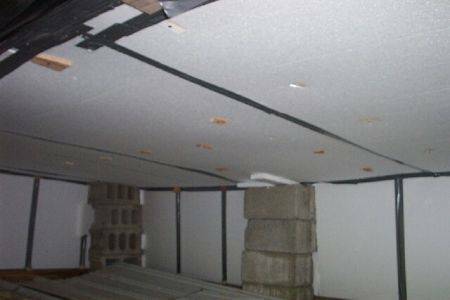 Extruded polystyrene is ideal for basements and slabs and makes an ideal choice for insulating under a mobile home if the added cost isn’t an issue. 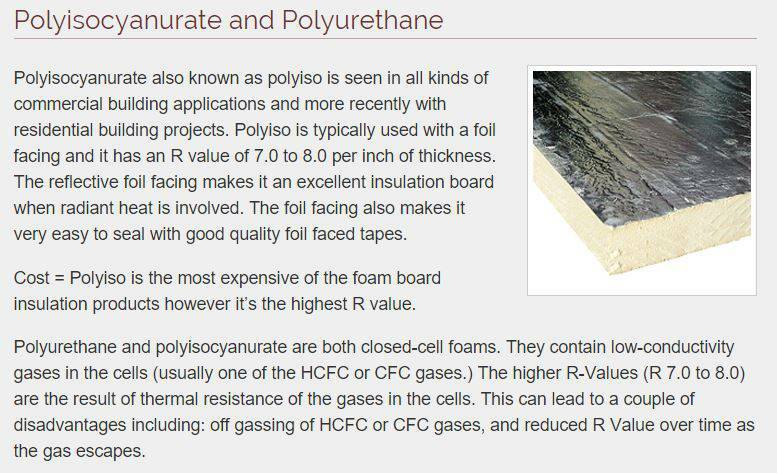 Polyurethane and Polyisocyanurate have advantages and disadvantages. They have higher R-Value per square inch but they are also the most expensive of the three types of rigid foam. An advantage of polyurethane is the foil that covers the sides. The foil can act as a vapor barrier and is used most often in roofing and foundations. Fiberglass is the most common insulating material. It is made of very fine strands of glass formed in rolls and loose fill batts that are installed between beams, joists, and studs. Since it is made of glass it is an excellent insulator that is affordable, non-flammable, and water resistant. The downside is that it is fairly dangerous to handle. You’ll definitely want to use protection when working with fiberglass. Depending on density you’ll get R-value ratings ranging from R-2.9 to R-3.8 per inch. Spray foam is most recommended for already enclosed areas such as the walls or ceiling/roofing of a mobile home. It’s fairly expensive because you have to have special equipment. Spray insulation can be made of a variety of materials. Most common is cellulose (newspaper), foam, and fiberglass. Learn more about spray foam here and here. Here are a few videos that may help you learn more about insulating your mobile home using the three main types of insulation, foam board, fiberglass, and blown insulation. The second video shows how fiberglass insulation is added to a mobile home. The second is a informative resource on auditing a mobile home for energy use and various methods of adding insulation. While installing any type of insulation under a mobile home you will likely be dealing with the underbelly. In most cases of older mobile homes, the plastic sheeting known as the belly wrap or underbelly has been damaged or even removed completely. In these cases, adding foam will help tremendously – it can act as an air barrier, vapor barrier (humidity guard), and insulation. Damage to your underbelly is most commonly caused by animals but repairmen are notorious for leaving the cut open. When hiring professionals to make repairs under your home (and above the underbelly) make sure the total cost includes repair to the plastic. First, measure the space needed to be covered. Cut a piece of Tyvek that is at least 1 foot larger than the hole on all sides. If the hole is really large, wrap one edge of the Tyvek around a long 1×2 inch furring strip. Screw the 1×2 to the bottom of the floor joists next to one of the steel I-beams. Drape the fabric under the main duct trunk line so that space for insulation remains. Wrap the opposite edge of the replacement fabric to another 1×2 furring strip, then screw it to the joists next to the other metal frame. Glue and stitch the other two sides of the replacement fabric to the existing belly. It is recommended that all mobile and manufactured homes have a ground moisture barrier. A barrier is usually just a polyethylene plastic sheeting placed directly on the ground and secured under the home to act as another shield between earth and home. The ground barrier combined with a vapor barrier (whether via a separate belly wrap or foam installation) will protect your home from moisture. It can also deter animals from going under your home and help you locate leaks and water issues as the water will sit on top of the plastic instead of soaking into the ground. If you Google foam insulation under mobile homes you’ll find a variety of photos and informative articles. Below are three that can help you understand more about using foam as an insulation under and on your mobile home. Inspections are a necessary evil in the construction world, regardless of what kind of DIY project you do. Every location, whether in Canada or America, has building codes that must be met for all update and remodeling projects. The location of your home will impact the codes that you will need to meet. Homes in Canada face different issues than homes in Florida so be sure to research your local codes. If your home is losing heat or seems harder to keep heated or cooled you may want to consider insulating under your flooring as the first step in updating your home. 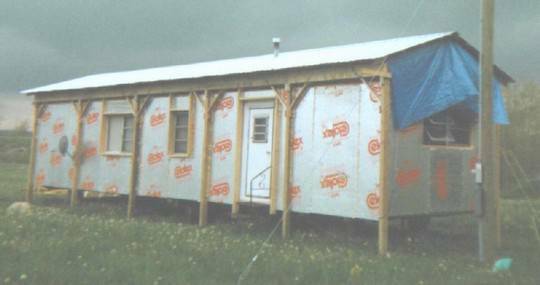 Insulating your mobile home with foam is proven to be effective. The foam is easy to use and fairly affordable for its high R-value and energy conservation properties. Laurel states that she doesn’t think insulating the walls would have made nearly as much of a difference as the underfloor insulation has and she would know best, it hit -4 Fahrenheit last week and their home stayed warm and the death zone is long gone. A HUGE thank you to Laurel and Bryan Adams for sharing their project and to Laurel for the awesome drawings! Thank you so much for reading Mobile Home Living! With foam board insulation, as in your January 17, 2016 article, and using a 6 mil ground cover under the home, do you need a separate belly wrap? My wife and I will be replacing much of the subflooring in the 14 x 48 singlewide we’re buying in WV, and figure we can do a lot of the work from above. With a rigid foam board bottom, could spray foam be used instead of the cut-down rigid sheets, or would we need to go to an exterior grade plywood bottom due to the thermal reaction of the spray foam? We’re going to replace the water lines with Pex, and go to interior wall-mount heat to replace the furnace, and thereby eliminate the need for ductwork for our small space. Thanks Crystal. Congratulations on the new home! I’m from southern WV! It’s a beautiful state. So, I’ve always been told that you should always have a belly wrap and a ground covering. It’s at least another layer of protection from critters. However, you’ll would want to make sure you have ample ventilation. I recently wrote an article about insulating a mobile home. In the energy guides I’ve read, they tested foam against the blown insulation and blown had a better R-Vlaue. I’d stick to the foam board, the pink rolls, or the blown in. Take lots of photos – I’d love to share another beautiful WV home! Thanks for this info!! Very helpful! I’m thinking about putting clear vinyl around the inside of my single wide skirting. What are any possible problems this might cause? It depends how you install it. If you already have a skirt then I would recommend adding a better belly wrap or ground covering (using a ‘poly’material) over anything else. If you’d just hang the clear vinyl behind the skirt it would likely cause some ventilation and condensation issues and wouldn’t offer any true advantage toward r-value or wind/weather shielding. I’d put the money on belly wrap more than anything. (If I misunderstood just let me know). I’m not really knowledgeable about underbellys, I’ve only been around a couple of replacements. I do know that too much insulation causes a lot of damage. I know a guy that insulated his home so much that it didn’t have the proper circulation or ventilation and he ended up with a huge mold and mildew issue. And, I know the underbelly is absolutely vital to a mobile home and should be tear-free and sealed well so that critters can’t get in and heat doesn’t escape. I’m not sure how the earth or sun’s energy, or heat, can impact the home from the bottom but I will say that anytime the word thermal is used on a product I get a little suspicious. Mobile Home Repair at mobilehomerepair.com may be able to help you more. Having a hard time finding insulated skirting for my mobile. Currently have skirting on, live in Wisconsin where it gets a little cold sometimes. Any suggestions? Also gaps in the underbelly as well as visible ductwork. Definitely get the underbelly taped back up, you may be able to insulate the ductwork a bit in the process. Taping the joints and bends wouldn’t hurt a thing before you tape the plastic. You probably have to special order the insulated skirting if you can’t find a distributor. Google ‘insulated skirting for mobile homes in Wisconsin’ and you’ll likely find a website from the manufacturers and they usually list their distributors. You may have one local. Otherwise, you’ll either need to order it online or make it yourself. Any thoughts on something I read regarding using rolls of asphalt roofing, it might have said the roofing “paper” that goes under the asphalt, and just laying it out over the ground under the trailer to keep the ground moisture from being drawn up into trailer. I’m already using rigid insulation between the floor joists. Any answers would be appreciated! Thank you. I’ve only ever seen 6 mils thick black polyethylene recommended for ground moisture barriers. I would think the felt would work though it probably costs more. There are a few different ways to install OSB (removing the metal or going under, or stripping and installing and bracing – it all depends). But, if the porch isn’t heated most homeowners will just go with metal (no OSB) to reduce cost. There are so many factors in play I can’t really answer this question. 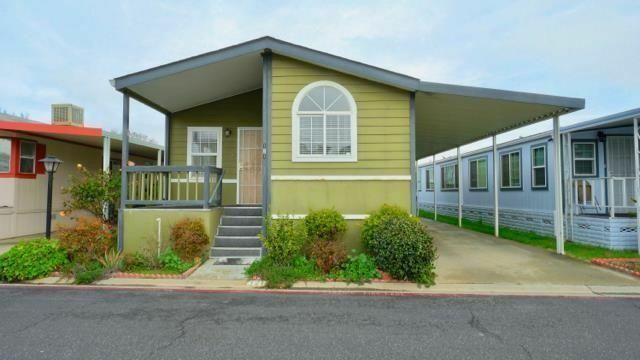 It’s tough trying to buy an older mobile home. Structure (framing, roofing, doors, windows, etc) and insulation are the most important aspects of the home. Installing new insulation will be a great investment though – you’ll definitely save on your heating and cooling. You can install the lower cost pink insulation to save a little money (and it’s a bit easier to install so you can save on labor, too). Sorry, Kayla, you will have to buy the insulation yourself. I have steel skirting and the clips that attach the panels have broken off – I cannot find them anywhere online. Any clues where I can purchase? You will want to go to a contractor’s supply house and show them an old one. I found an online store that may have what you need but I just found them through Google so I know nothing about the company (but it may help you find the name of the clamp at the very least and you can go to Lowe’s or Home Depot and find them there). So you do the foam board and the underbelly sheeting? I just received a mobile home in fairly bad shape and am trying to fix it up while saving money at the same time. Yes. The foam is the insulation and the plastic sheeting will block condensation from the ground along with a few other important things. Definitely want both! Usually, tackling a project requires multiple sites and multiple opinions. Since I knew in my mind I had to insulate between the joists then cover that insulation, I set out to find help. I found the only instructions I needed, and it is so thorough, I can’t wait to get started this weekend. I bet one of you is an engineer. I would like to no how do you get intouch with some that knows how to repair installation underneath a trailer with installation thats not to expensive to save energy at a good price . If you have a local mobile home parts supplier call them and see if they know of anyone. A handyman service may be able to do it – it’s just a lot of crawling and stuffing! Best of luck! Unless I’m mistaken, you live in a place managed by the owner of the land, so i would ask them; they are the best people to start with. If not, then if you live in an area with many mobile homes like I do (seashore in New Jersey) there are tons of supply stores selling part. Go see them, and ask them who they know. Nest, ask your neighbors who they use for their repairs. All this assumes you live in “park”. Again, if not, I’m sorry and use Crystal’s advice and call around. Awesome Sauce!!!! Thanks, we will use this information!!! !